A number of nonprofits, including the Salvation Army, the American Red Cross and Susan G. Komen have canceled plans to hold fundraising events at the Mar-a-Lago Club and other Trump properties. These cancellations are in response to what many feel to be inadequate and offensive statements from President Trump about a recent white supremacist march in Charlottesville. President Trump’s initial response was that there were bad actors on “both sides” and that there were some “fine people” marching alongside the self-described Nazis and white supremacists attending Unite the Right. What decisions have nonprofits relevant to the neurodiversity community made in response to the President’s statements on Charlottesville? This article outlines which organizations have stood by President Trump and which have not, as President Trump makes unprecedented attacks on programs like SSDI and Medicaid that many in our community need to survive. Autistic people who are also marginalized because of their race or religion already face many challenges. This is an opportunity for organizations to make a statement by standing with those who rely on social services. Since President Trump has not divested from his businesses, cancelling an event at Mar-a-Lago or any other Trump property isn’t just a symbolic gesture. It has an impact on President Trump’s income and profits. President Trump has long been a supporter of Autism Speaks and its founders. 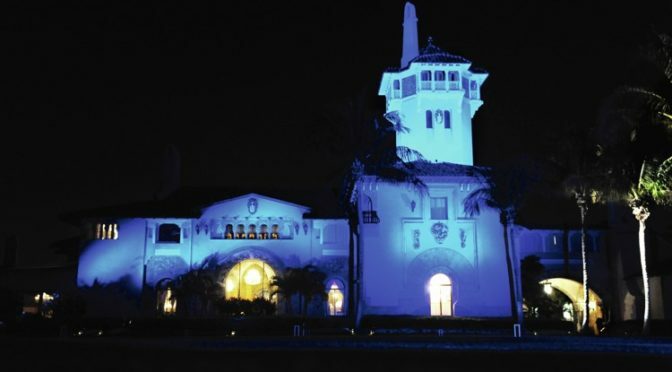 Unfortunately, lighting up Mar-a-Lago and the White House blue doesn’t help autistic adults live more independently or get us access to healthcare. As President Trump moves to cut food stamps, he should remember that autistic people can’t eat blue light bulbs. Neurodivergent people need actual, not symbolic, support from the President and his administration. The Autism Project of Palm Beach County has decided to take their business elsewhere. Their president, Richard Busto, told the Washington Post that his organization has decided to cancel a future events at Mar-a-Lago. The group has held annual galas at Mar-a-Lago every year since 2008. Unfortunately, we were not able to reach their organization for comment. The Autism Project of Palm Beach County runs two segregated charter schools as well as adult day programs. The Ryan Licht Sang Bipolar Foundation is named for the son of its founders, Joyce and Dusty Sang. It funds projects connected to bipolar community needs. The foundation announced Friday that its January symposium luncheon will not be at Mar-a-Lago as originally planned. “We stand with the community. “I think people are standing up for what they believe,” the foundation’s co-founder, Dusty Sang, told the Washington Post. The Els for Autism Foundation, in contrast, has gone on record refusing to move or cancel their event at the Trump National Golf Club. The Els For Autism Foundation is a Jupiter-based non-profit established in 2009 by golfer Ernie Els and his wife Liezl. Mr. Els has a longstanding friendship with President Trump. President Trump has gifted properties to The Els Foundation to build a segregated school. Recently, Mr. Els went golfing with President Trump. “We do not have any plans to change any of the venues for our upcoming celebration,” Pamela Minelli, the foundation’s director of development, told the Palm Beach Post When called for further clarification, the organization declined to comment. Do you live in South Florida? What are your thoughts on these nonprofits and foundations? Have you received services from any of them? What are your thoughts on event cancellations at Mar-a-Lago? Please share your thoughts in the comments. The Els foundation should learn to put what is right versus what lines their pockets. The views expressed by our President cannot be tolerated. Shame on them. I thought this was Amy Sequenzia country. Or at least her father is there. And also Alexander Cheezem country. Joseph: I agree about the Els Foundation. It has reminded me of many sportive organisations in this fun run season and as the football finals are gearing up in my part of the world. One of these is the Luke Priddis Foundation. If I find that any Australian or New Zealand organisations are meeting at any Trump properties or are invited there, for, say G’day USA in 2018 and the midterms. And of course this is also Kelle Hampton country – Naples. The three non-profits in the beginning of the article have not had the sunniest of reputations. I remember at least one big scandal about them in the previous 20 years. Institutional memory can be and should be long. I know that there is a lot of churnout and burnout in the nonprofit world. And then I remember a wonderful Floridian advocate called Monica Pignotti with whom I had the pleasure to work during 2008-12. It has been interesting to see “when the generals talk”. And that expression seems more apt than ever with the recent turns in the Trump Administration.